Ignoring the growing pool of water on the floor, I threw my weight against the dresser, pushing it in front of the ill-fitting hotel door. Wind screamed around the corners of the building, throwing chunks of concrete at the window as I peered through the warped glass into the darkness, wondering how many more hours the storm would last. Just one day earlier I was laying on a dock over crystal clear water in the hot Caribbean sun. Now I was in the middle of Hurricane Earl. I was on Caye Caulker, a tiny island off the coast of Belize, at the start of a month-long solo backpacking trip through Central America. With no cars or pavement on the island, Caye Caulker felt like a hidden paradise. My hostel had a dock off the back where I’d seen stingrays swimming past during the day, and at night coconut crabs scurried around in the sand. I’d only been there a day when I heard about a tropical storm making its way towards the islands, but I wasn’t worried… until the next morning. The next couple hours were chaotic. Nobody had any solid information, but the overwhelming consensus was, “We’re getting the heck outta here.” People left the island in swarms before the taxi boats stopped running at 2 p.m. Soon the island was nearly deserted save for the locals, me and a couple British guys at my hostel. The guys and I were pretty hesitant to stay at our hostel since it was a couple of pretty dodgy wooden buildings just a few feet from the water. We’d heard the hurricane, while only a category one, was still going to cause at least 75 mph winds and six foot floods. We found a hotel that seemed more secure and got our rooms for cheap as long as we promised not to turn on the A/C. After a while I headed out to see if I could find any non perishable food. Everywhere I looked, people were boarding up their storefronts and houses and bringing their boats out of the water to store on hopefully dry ground. Intermittent downpours turned to continuous heavy rain and huge waves began breaking over the reef on the horizon. Nobody bothered using an umbrella or even wearing a raincoat, so I joined suit as the wind was so strong they wouldn’t have been much help anyway. As tense as the island was, there was a palpable excitement in the air. I’d heard that tradition was to have a “hurricane party” which, just as it sounds, is to drink your way through the storm. I’d also heard that, in an attempt to stop the entire island from getting spectacularly drunk, the police halted all alcohol sales 12 hours prior to a storm hitting. At a little shop, the cashier slid a bottle of rum in a paper bag and motioned for me to leave quickly. Rum in hand I made my way back to the hotel, now properly ready for the hurricane. Alone in my room, I took a hot shower then hunkered down with a book I’d borrowed from my hostel. As I read, the wind picked up and the lights started to flicker, finally giving out completely, which is when I realized I didn’t have a flashlight. Just in time, I heard yelling outside my room and opened the door to find the Brits, drenched but with flashlights. We decided to head to their room to pass as much time as we could with our bottle of rum and a deck of cards I’d found. Their room was only one story above mine, but the stairs were on the outside of the building and the wind was already so strong we could barely get my door shut. We crept along the side of the building, crouching as low as we could up the narrow metal stairs to the third floor, barely keeping our footing on the slippery steps. Inside we barricaded ourselves in as best we could and put all our belongings in the bathtub, because it seemed like the driest place. Water blew in under the door and around the edges of the window and eventually we gave up trying to keep it out, letting the small pool grow into an inch of standing water. We played cards for a couple hours as the storm grew worse. So many chunks of concrete were hitting our windows that we decided it was way too dangerous for me to go outside and back to my room, so I stayed with them. Just after midnight we heard a terrible crash behind our hotel. Peeking out the back window, we saw people running and yelling. The storm was so loud that even ear plugs wouldn’t drown out its racket and our room was hot and stuffy, but we finally drifted off to restless sleep. A few hours later, I woke up to absolute silence. I pushed the dresser away from the door opened it slowly, unsure of what I would find outside. I stepped out into a different world. Pieces of houses and tree branches covered the ground, pushed into piles by the wind. Power lines twisted across the ground and sand filled the entryway of my hotel. I checked my room and found that a small crack in the ceiling had turned into a large hole and, while my backpack in the shower was still dry, the walls were wet and my mattress was soaked, and I was very glad I had not gone back to my room. Heading to the beach, I walked where the main road used to be. Every little wooden stand that sold food, fishing boat trips or snorkelling tours was gone, like they were never there. The tiny police station was tossed on its side, boats were overturned and a dog was barking, uninjured but trapped in a courtyard by debris. Wandering down to the water, I dipped my toes in. What used to be bathwater warm, crystalline water had turned murky, gray and frigid. But there was beauty to the chaos. 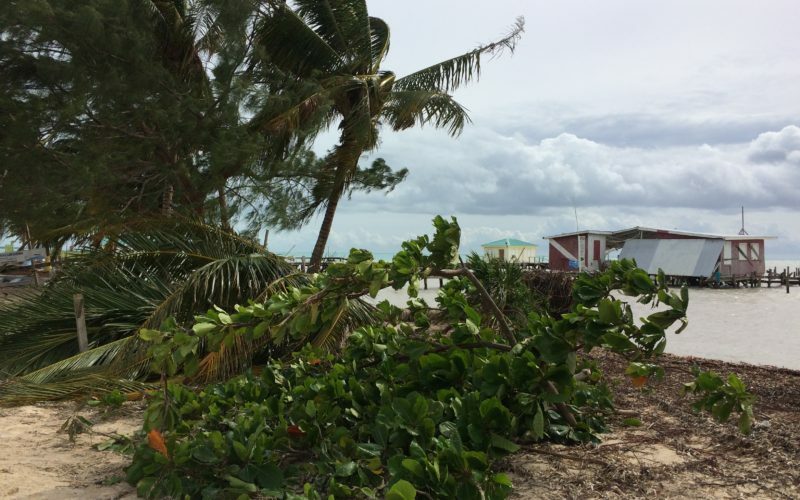 The storm had tossed up huge conch shells, some of them in perfect condition. I picked one up and a local man showed me how to wash the sand out, revealing a shiny pink inside. Everywhere I looked, people were helping each other dig out storefronts and remove boards from windows. I went back to the hostel I had been staying at to pitch in and help everyone clear it out. Several hours of exhausting work later, the yard was mostly free of huge palm branches and trees that had fallen down. I was sweaty and disgusting, especially since there was still no power on the island, which meant no showers. As soon as the boats started running, Caye Caulker filled with people just like before the hurricane, but something changed for me. If it wasn’t for Hurricane Earl I wouldn’t have been able to watch shooting stars in pitch black before the electricity came back, and I wouldn’t have stayed on the island long enough to run to the tiny Chinese place down the way to get dinner for the owner of my hostel. My trip may have been thrown off by a few days, but the unexpected parts of traveling nearly always end up creating the best memories.